I like it a lot and I want to make fun of it too. 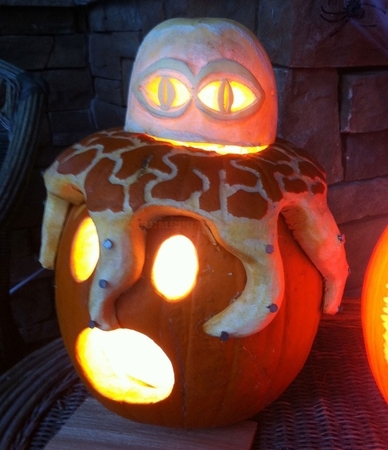 It's a great idea, an octopus eating a pumpkin. It is well carved from the three pieces, but I can't cut the poor guy any slack over those giant tacks holding it together. My tip would be to use toothpicks to hold your pumpkin pieces together. Toothpicks work really well and they blend in well too. Great job!